As the year draws to an end I present one of two treats for players of Slaughterloo and Flintloque. This time for Slaughterloo the mass battle game set in the World of Valon and the fantastic Ferach Armee of Mr Kim Allman. 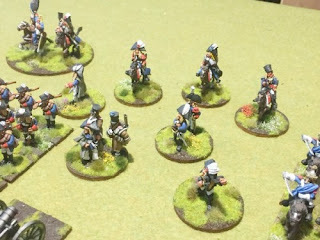 With his kind permission here is his account of this mighty 28mm force of more than 700 miniatures. The leaders of the Ferach Empire, these fine soldiers form the core of all troops under their Tyrant Emperor Mordred. Some of the fastest and most motivated troops of the Napoleonique Wars of Valon. The Commander of all the Ferach Empire. The Emperor Mordred. Officers, both mounted and on foot ensure that the Emperors orders are carried out. Best of the best the Velite Grenadiers de la Garde are the anvil upon which the Armorican Armee sits. An excellent centre piece for your Elf forces. There are hundreds of Regiments of Elf Line, Regt de Ligne, armed with Armorican Muskets. Supporting the line troops there are the mean and tough Bog Orcs of the Guinalean Legion. Armed with Armorican Muskets or captured Bessie Muskets and classed as Infantry. They are led by Elvish Officers. The Bog Orcs of Guinalea live in a conquered homeland. While most serve Kyng Gorge and Albion some flee and join the ranks of the Ferach organised Guinalean Legion with dream of an Elvish victory that will free Guinalea. Tough and ruthless troops the Legion goes toe to toe with the Orcs of Albion in Catalucia. Lacking the glamour of the Ligne and the professionalism of the Garde, Militia Regiments perform important roles non the less. Elf Carabiniers. Elite and veteran Elf skirmishers hardened from battle armed with Armorican Muskets and classed as Light Infantry. Chasseurs are elite and can be classified as Guard troops. They skirmish in front of many Elf Regiments. Hundreds of Tiny Kingdoms and Comic Opera Baronies make up the conquered Confederation of Finklestein and Dwarves inhabit many of these small states along with Dogmen and Ogres. Create your own army within the Confederation. Commonly referred to as ‘Confederation Dwarves’ or ‘Confederation Dogmen’ or ‘Hunvarian Ogres’ these troops serve alongside Armorican Elves in Catalucia, the Witchlands and elsewhere. From the Confederation of Finklestein come huge Finklestein Guard Ogres forming the Old Guarde in Bearskins and armed with mighty Kannonderbuss. Artillerie is central to all the nations and client states of the Ferach Empire. The 2eme Garde Artillerie a’Cheval are veterans and almost unique in the Armorican Armee since they are Horse Artillery. They take cannon to battle by pulling them with horses meaning they are very agile and feared. An excellent centre piece for your Elf forces. The L’Esprit du Garde are veteran Elvish heavy cavalry classed as Cuirassiers armed with straight bladed heavy swords. The Grenadiers a Cheval du Perdue are know as ‘The Lost Souls’ veteran heavy cavalry in the Army of Armorica they are the constant foes of the Undead in the Witchlands. Heavy cavalry classed armed with straight bladed heavy swords. Fighting on horseback the Corps Imperial des Dragoons are elite in every sense of the word. The scorge of the Witchlands and led by the veteran Gui de Carcharoth. These Elite Hunters of the enemies of the Empire will always be found in the thick of it. The Field Hospital, an unfortunate necessity on the battlefields of Valon. The Ferach Empire is truly a mighty war machine and even more so when other loyal states flock to the banners. 718 figures not including Artillery, Crew, Limbers, Officers or Commanders. After the game the miniatures are packed away in their trays and into these wooden carrying cases ready for next time we play Slaughterloo.